Trying to pinpoint what exactly in your car is making that weird ticking noise can drive anyone to madness. As sensitive as our ears are, they're not always as great at precisely locating where a sound is coming from. Thankfully you have four other senses to help, particularly your sight, which this unique SeeSV-S205 acoustic imager lets you use to actually see sound. 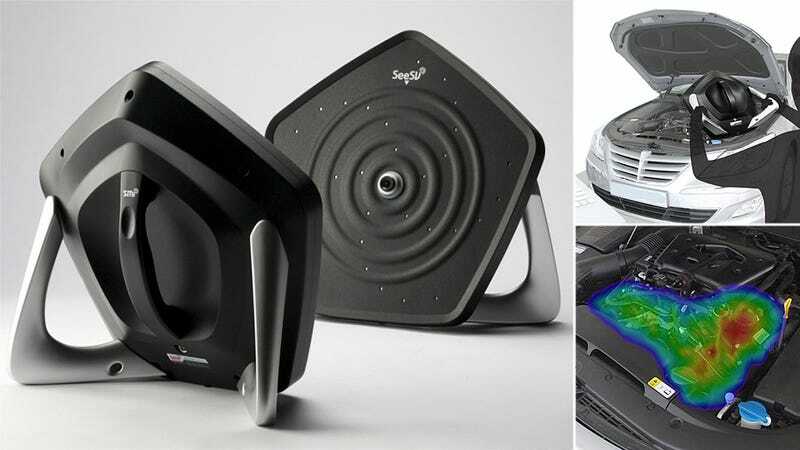 Designed by Professor Suk-Hyung Bae and developed by a joint venture between SM Instruments and Hyundai, the four pound 'camera' uses 30 sensitive microphones arranged in a spiral pattern to provide visual feedback on sound intensities. Think of it as a thermal camera that's more concerned with decibels than degrees.